I’ve got to make a special mention of Tasmania travel, as this is one of our favourite tours from Melbourne – and seems a somewhat forgotten on many itineraries. Tasmania, formerly called Van Diemens Land, is intimately connected with Melbourne. John Batman, a Tasmanian farmer, sailed across the Bass Straight in 1835 and started the settlement of Melbourne. You can spend as little as a weekend, or as much as a few weeks there. Tasmania is deceiving. It is small but because of its mountains, wilderness and winding roads, it appears much bigger – and it takes quite some time to cross from one end to the other. There are two ways to cross the 250 or so kilometres from Melbourne to Tasmania. 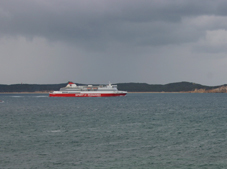 One is across the ocean with the Spirit of Tasmania; the other is by plane. You can also do both, fly to Hobart, rent a car and take it back to Melbourne on the boat. This is what we did on our latest Tasmania trip. We arrived at Hobart International airport, which really feels like a backward stop at the end of the world. There is nothing else between you and Antarctica. Hobart itself is quiet. It was established as a penal colony in 1803, which makes it one of Australia’s oldest cities. You find stately buildings, an attractive harbour, but also all the shops and businesses of a modern city. It is watched over by Mount Wellington, which gives you fantastic views of the area on a clear day. Just over an hour’s drive from Hobart you can visit Port Arthur, the convict settlement and penal colony for the hardest criminals at that time. It has been turned into a tourist facility where you can experience what it was like. On the way north out of Hobart we could not get our kids past the Chocolate Factory which you can tour and where you can buy chocolate at bargain prices to last you the rest of your Tasmania travel. We stayed a night in Launceston, another ‘old’ Australian town set inland in the picturesque Tamar valley. 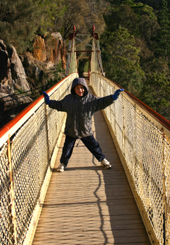 The Cataract Gorge, one of the natural wonders of Tasmania, is right on its doorstep. It has the longest single span chairlift in the world – and a suspension bridge - crossing the stunning river cut deep into the mountain. You can easily spend a few hours there. On your Tasmania travel you’ll notice that time to Tasmanians does not seem the same as in the rest of the modern world. People have time, are friendly and care, - and even a short visit feels like a long time in this totally different world. We travelled across the hills across to Mole Creek Wildlife Park . This Park particularly impressed me because of the knowledge and care of the operators. Their love and dedication is even reflected in the good nature of the animals. 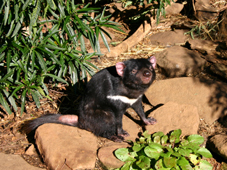 It’s a great place to see a whole bunch of Tasmanian Devils, found exclusively in Tasmania, or another carnivorous marsupial, the endangered Spotted Quoll. 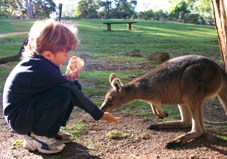 You can pat wallabies that run freely through the park, and admire just about any other Tasmanian wild life. From there we climbed the winding narrow roads up to Cradle Mountain, where we spent another night. Cradle Mountain is one of the famous Tasmanian tourist sites. It rises 1,545 metres above sea level. The climate is unpredictable – you are in real wilderness up there, with anything from ice, fog and rain to the most stunning clear days (which we were lucky to catch). We went on a half day bushwalk around the lake, which was worth it with its changing scenery and view of Cradle Mountain. 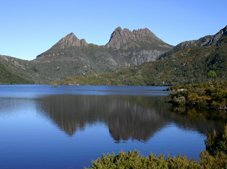 For something more strenuous you can climb the mountain itself or start on the overland track that takes you 65km through the Tasmanian wilderness to Lake St Clair in the Central Highlands. From there our Tasmania travel took us towards Devonport to catch the Ferry to Melbourne. 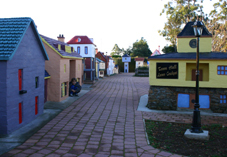 We stopped over in Tasmazia (www.tasmazia.com.au) , the home to the World's largest maze & the Village of Lower Crackpot. 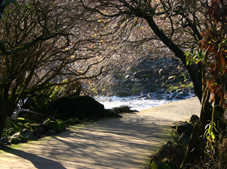 It is located in Promised Land on one of the winding rural roads between the mountains and the coast. It has been created by a dairy farmer with a vision more than 20 years ago and is a place of intricacy and creativity, not one of those manicured tourist attraction. We spend hours running through the mazes, finding hidden areas and locations. It has 8 mazes. One of them, the Great Maze, is the largest in the world; another one is the exact replica of the famous maze at Hampton Court Palace in England, which we were not able to crack it by closing time… - a lot of fun. From there it’s just an hour or so to Devonport. There you get to board the Spirit of Tasmania, a large passenger boat that takes you to Melbourne and is an opportunity for sea travel. It is an enjoyable overnight trip (during the summer month you can also travel during the day, which we would have preferred). A great way to return from the Tasmanian pace to the city pace of Melbourne! For the above trip you need a minimum of four days, a few more is better. It is only one snapshot of the many Tasmania travel tours you can take. There are at least 3-4 more waiting for us, before doubling up on any areas.